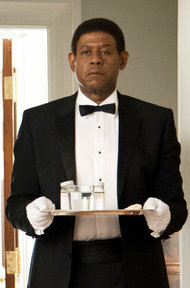 The Butler may be inspired by a true story, but it is not based on a true story. There was a person, Eugene Allen, who served presidents Truman to Reagan as a White House butler, but beyond that, pretty much everything about the character is pure fiction. Virtually nothing about the butler of the movie, Cecil Gaines, aligns with Allen's personal life. Ironically, much as Anderson and his cast insisted that The Master was not based on L. Ron Hubbard, perhaps fearing repercussions from Scientologists, Anderson did enormous research on Hubbard, and The Master reflects it in many biographical details. I found The Butler pretentious, but I always defend Quentin Tarantino and tell people who go to his movies and are offended by his excesses that they should realize by now that when one goes to a Quentin Tarantino movie, one is going to get a Quentin Tarantino movie -- so stay home if you don't like it. Some Tarantino films are better than others, but all are over the top. By now I should know that a Lee Daniels movie is going to be pretentious. And likewise some are better than others. The Butler falls in the weaker range, partly because it tries to cover so very much. As we march through the years and the decades, Daniels finally has to employ montage to squeeze in every historical benchmark. I tried to be generous and think, Well, maybe that's good for younger people who, unlike me, did not live through the times the narrative chronicles. That is to say, it works better as a history lesson than it does as a work of cinema. Slate's Forrest Wickham catalogs the historical record of L. Ron Hubbard's life and The Master's screenplay. Slate's Aisha Harris catalogs the historical record of Eugene Allen's life and the The Butler's screenplay. Unlike The Butler, Steve McQueen's 12 Years a Slave is a remarkably faithful adaptation of Solomon Northrup's autobiography no matter how implausible a particular detail may seem, as historians Sue Eakin and Joseph Logsdon attest in their 1968 edition of Northrup's book. I saw Michael Fassbender the week before in The Counselor and Fassbender and Brad Pitt play off each other in that film. Seeing Fassbender in 12 Years a Slave and the two actors face off again, I was gratified to have the opportunity to watch a master of his craft in such dramatically different roles back to back. Fassbender melts into his characters. He is hardly recognizable from one to the next. (He is also McQueen's faithful collaborator.) 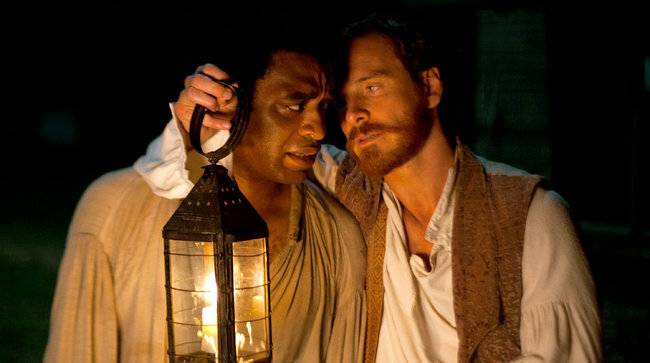 Chitwetel Ejiofor is also a powerful presence on screen who succeeds in communicating a broad range of emotion in a character whose condition consigns him to silent deference and submission. The film is brutal, filled with brutal characters of which Fassbender's Edwin Epps may be the most sadistic, though it is a distinction for which many vie. Mr. McQueen has assembled an impressive cast, all of whom are excellent: Benedict Cumberbatch (William Ford), Paul Dano (John Tibeats), Garret Dillahunt (Armsby), Paul Giamatti (Freeman), Scoot McNairy (Brown), Adepero Oduye (Eliza), Sarah Paulson (Mistress Epps), Brad Pitt (Bass), Michael Kenneth Williams (Robert), Alfre Woodard (Mistress Shaw), Chris Chalk (Clemens), Taran Killam (Hamilton) and Bill Camp (Radburn). Lupita Nyong’o as Patsey is heart wrenching. I was a little baffled, however, by the cinematography. With the exception of about a dozen shots, which, were they stills, would look like submissions to a nature photography competition, the visual aspect of 12 Years a Slave is bland. McQueen came to feature film out of the London art world, where he continues to exhibit conceptual video pieces, and he is represented by a gallery there and one based in New York and Paris. Hence, the lackluster look of 12 Years a Slave seemed odd to me. As I watched, I noticed that often the camera does not move. The characters move through a static background which often looks bleached out. I wondered if this is meant to reflect the lives of those imprisoned on the plantations, the static nature of their enslavement day after day, year after year. I looked through reviews to see if anyone else commented on this component of the film. Manohla Dargis and David Denby had interesting takes on it. Dargis argues that "Mr. McQueen has largely dispensed with the conventions of art cinema to make something close to a classical narrative; in this movie, the emphasis isn’t on visual style but on Solomon and his unmistakable desire for freedom." Denby observes that "It shows up the plantation scenes of Gone with the Wind for the sentimental kitsch that they are, and, intentionally or not, it’s an artist’s rebuke to Quentin Tarantino’s high-pitched, luridly extravagant Django Unchained." Some of our more courageous Holocaust films delve directly into questions of evil, the capacity of ordinary people to justify acts of utter depravity, the human spirit and its power to endure unspeakable suffering or its temptation to forsake hope altogether. 12 Years a Slave is rare in turning that gaze onto the institution of slavery in the United States. That said, I believe the critic Edward Rubin makes an important observation when he says that "12 Years a Slave ... is too by the book, and its relentless attempt to have the last word is laced with a heavy dose of didacticism." The debasement and torture that Northrup endures throughout his ordeal is paralleled in the character of Patsey who, broken by implacable horror, begs Northrup to drown her. In a way, Patsey is doubly enslaved, as a tyrannized captive like Northrup and as the object of Epps's sexual abuse. One of the ways in which Mistress Epps punishes Patsey is to refuse to allow her to bathe. When Patsey returns from the neighboring plantation and pleads with Epps to spare her, she tries to prove she is telling the truth by opening her palm to reveal a tiny cake of soap for which she has risked so much, a desperate entreaty for ablution. Epps commands that Northrup whip her. Unsatisfied, Epps finally grabs the lash and proceeds to flay her. Of any sequence in the film, I found this the most affecting. Patsey's shame is bottomless -- her smell, she says, makes her gag -- and the anguish Northrup endures in being forced to raise a hand against such a tormented innocent is palpable. 12 Years a Slave fixes an unblinking eye on the inexorable damnation to which our country condemned generation after generation of a guiltless people. We would be wrong, I believe, to view this narrative as historical, as an anomaly of the past. Enslavement endures to this day in the gun-fueled violence of abandoned inner cities and in prisons across the land; human trafficking flourishes across the globe. Slate's Dana Stevens, Aisha Harris and Forrest Wickman catalog the historical record and the movie's screenplay. Stanley Fish has written an excellent piece on 12 Years a Slave and Steve McQueen's narrative choices in the New York Times Opinion Pages, 11/25/2013.